Last night was so fun. We had a reunion dinner with Omy.sg, HKTB and all the Singapore Blog Award (SBA2010) bloggers who went to Hong Kong. It was so nice to see everyone again, and also to meet Ms Lee Kuan Fung (Omy.sg editor) and Mr David Leung (Regional Director, HKTB South-SEA). David kept our table in stitches! You won't believe our dinner conversation topics! 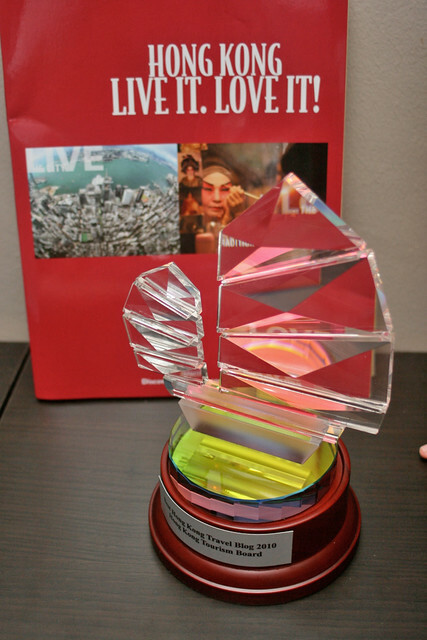 What I didn't expect was to win the "Best Hong Kong Travel Blog 2010" award. We all put our HK posts collectively on Omy's My HK Travel Blog 我的香港之旅 and the best collection would be given a 3D2N trip to HK. But to be honest, I gave up competing for this very early on (while we were still in HK, in fact), as I was just awed by everyone else's posts. So I thought it would be more relaxing and fun to just focus on doing what I love best - those food photos! But I'm very grateful for another chance to go to HK again, maybe this time in winter (I have until end Feb 2011). You know you can never have too many trips to HK! I really wish everyone could come with me. The trip we had was such an experience. We went as almost-strangers and came back as friends. Thank you, HKTB, Omy and everyone who voted in the contest. The results of the voting contest is out today. Congratulations to Benjamin Sng who won the 3D2N trip for two as well. This is the only time these two will get to touch the trophy! I'm still having difficulty believing I got another trip, but I guess I should start researching again for more good eats to explore - your suggestions are most welcome! Maybe I'll finally find Tim Ho Wan. Maybe some molecular gems at Bo Innovation (it's right next to Yin Yang). Definitely a nice hotpot. Or some new, undiscovered hole in the wall. There's just so much to experience, foodwise, in Hong Kong. Congrats Catherine! I know how hard it is to churn out so many posts while you were traveling but you did! You deserve this win! Argh I can't wait until the next trip to Hong Kong myself. Be on the lookout for a good time to book the tickets. Pre-CNY would be a GREAT time to chill, immerse oneself in the camaraderie and of course .... walloping those delicious foods over and over again. Congrats!!! My husband is Benjamin Sng who won!!! I got to know of the contest through your food blog. I'm an avid fan! My husband and I voted for you! Thanks for letting us know about the contest through your blog. We are so happy you win!!! Shirley: Haha, thanks for understanding. Most of the posts were done after I got back to Singapore though - the schedule in HK was just too hectic! :) Some of us haven't finish posting yet! J2Kfm: Thanks! All I want is some winter chill! Jan/Feb I hear is the coldest, and just right for pre-CNY too! Hi Anna!!! Congratulations to you and hubby! Hope you will enjoy Hong Kong, and thanks again for voting! Congrats, Catherine! And the trophy is absolutely gorgeous! Charmaine and Ian: Thank you very much! Glad the posts turned out useful! YES!!!!!! Congratulations! I was absolutely sure that you will win a prize.